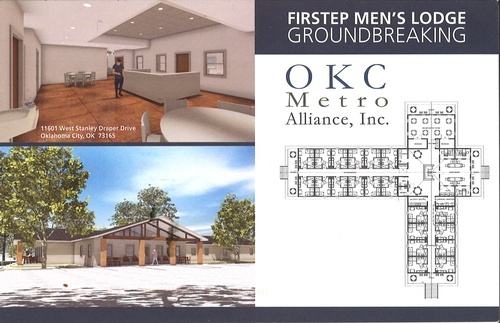 Event Description Ground Breaking for OKC Metro Alliance - Men's Firstep Recovery Program. Join us for this great celebration and fellowship! OKC Metro Alliance assist Oklahoman's who want to recover from substance abuse by providing long-term residential work recovery as alternative to incarceration. The new 8,115 square foot faclity will provide 20 single room occupancy apartments for low income men in recovery from substance abuse disorders. Ribbon Cutting Sponsor: Oklahoma City Energy F.C. Please join us for the groudbreaking event and a chuck wagon BBQ lunch.